A Campbell Scientific system continually monitors and controls water quality in each of 12 individual tanks at the Stolt Sea Farm facility in Elk Grove, California. The tanks house sturgeon, raised to produce premium caviar. 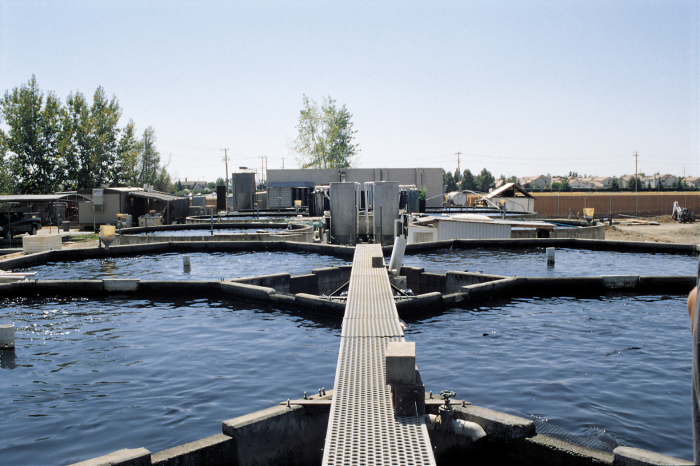 In August 1996, Stolt Sea Farm (www.stoltseafarm.com) installed a Campbell Scientific monitoring and control system at its recirculating facility in Elk Grove, California. The system monitors dissolved oxygen levels, water temperature, and total dissolved gases, and based on those measurements, automatically controls solenoid values for oxygen control. The Campbell system includes a CR10X, an AM416 multiplexer, and three SDM-CD16AC relay devices. The system constantly monitors the water quality of tanks used to grow sturgeon, which consequently produce caviar. The system constantly sends water-quality data from each of 12 tanks to a base station PC. Carl Beckham of Stolt Sea Farm has devised a very effective way to monitor oxygen from each of the 12 tanks, without the added expense of long cable lengths for each sensor. Instead of each dissolved oxygen (DO) probe being mounted to an individual tank, he has created a system where tank water continuously flows through PVC pipe to the monitoring station. Each OxyGuard DO probe is then installed in a standpipe attached to these flowthrough pipes. The system also uses an additional Royce DO probe. The CR10X is programmed to systematically compare the DO reading from each tank to the DO measurement received from this thirteenth probe. If the difference in measured values becomes too large, it is time to recalibrate the probe. The data that is monitored from the CR10X is displayed on an office computer at the farm. The CR10X communicates with the PC in the farm’s office via RAD short-haul modems. In addition, PCAnywhere software allows monitoring and control of the Campbell Scientific system from individual employee homes. Finally, an LED display on the monitoring station itself also allows current conditions to be viewed by workers inside the tanks. In early 1999, Stolt Sea Farm added a Campbell Scientific system to its facility in Wilton, California. Sensors in the Wilton system are placed in the drainage standpipes from each of 26 individual tanks. Because the CR10Xs are mounted inside Stolt Sea Farm offices at Wilton, the connection between PCs and CR10Xs are via direct wire. As at the Elk Grove site, the CR10Xs monitor DO levels and, based on the conditions, controls oxygen release into the tanks. Prior to installing the Campbell system, Stolt Sea Farm was using an OxyGuard system at the Wilton site. The new Campbell Scientific equipment completely replaced the monitoring and control system, while allowing the existing OxyGuard DO probes to remain in use.